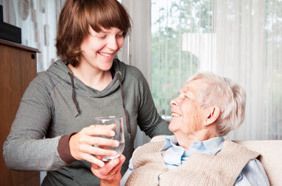 Home health care is a collection of wide-ranging services provided for each patient. Beginning with a thorough evaluation and a determination of clinical need, our services are provided in collaboration with your referring doctor and with any specialty physicians who are involved with the treatment of your family member. The goal of community-based skilled care is to assist each person to return to his or her optimum level of wellness. We believe the most conducive healing environment is the home environment. For information regarding specific home health services, please click on services listed below.